Most digital systems - such as the Qibec CPU - are implemented using electrical circuits performing Boolean logic. The following text first introduces Boolean logic (George Boole, 1847) by comparing it to common arithmetic. 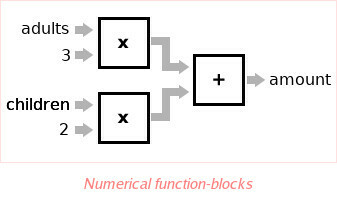 Numeric and Boolean expressions are then treated as "function-blocks", whose outputs depend on their inputs. This formula can be regarded as a "function-block", with the number of children and adults as input-values, and the total due amount as output-value. As can be seen, this particular function-block is constructed out of 2 sub-blocks, each containing a multiplication. The above formula used numeric terms (the amount of people, number of Euros). Boolean logic uses only the values "True" and "False" (or "1" and "0", or "high" and "low"). That is, every Boolean (sub)expression can be simplified to one out of two possible truth-values. "I get wet"  =  "I am outside"  AND  "it rains"
Here, the right-hand terms can be either True or False. The left-hand term ("I get wet") is only True if both right-hand terms are also True. 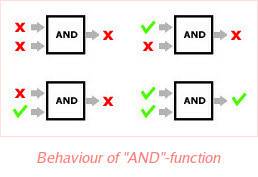 One such operator was the Boolean "AND", as shown in the previous formula. Some other operators that map easily to everyday expressions are "OR" (e.g. "panic = flood OR fire") and "NOT" ("dangerous = NOT safe"). 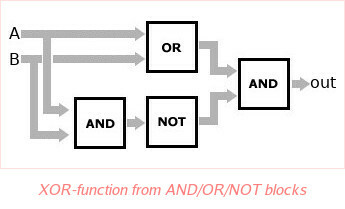 The Qibec CPU mainly uses 2 other operators, "NAND" ("not-AND") and "NOR" ("not-OR"), which can be regarded as an "AND" respectively "OR" function-block, followed by a "NOT"-block. "I can escape"  =  "window is locked"  NAND  "door is locked"
Or to put it differently: one can escape, unless both the window and the door are locked. "I am happy"  =  "I am cold"  NOR  "I am hungry"
Boolean function-blocks, like numerical ones, can be combined to form new blocks. For example, a new Boolean operator - "exclusive-OR", or "XOR" - can be constructed. This new operator states that something is True if either of two conditions are True, but not both. "movement"  =  "I push left"  XOR  "you push right"